What does a school, committed to teaching ‘environmental leadership’, do when faced with upgrading outdoor sports facilities? Where is the balance between delivering top-notch facilities and protecting the environment? Upper Canada College struggled with the question of installing a field turf for sports. Should they use grass (which requires regular watering, and cutting and is not usable in the winter)? Or should they use a man-made material (which requires less maintenance, no watering, and affords year-round use)? The story behind Upper Canada College’s decision to install artificial turf, and how they did it in a ‘carbon neutral’ way, is below. As an added benefit UCC took the opportunity to also install a geothermal system under the playing field which heats and cools their adjacent sports rink. Once again we see that actions speak louder than words. UCC article below is by Lindita Bushi, Stephanie Foster and Jamie Meil. Upper Canada College (UCC) in Toronto recently decided to replace one of its natural grass playing fields (“The Oval” field) with a new, state-of-the-art, artificial turf surface. This synthetic surface will be easier on the players’ joints and is designed to reduce sports-related injuries. In addition, because the artificial surface won’t freeze or get muddy when the weather changes, the sports season for both Upper School and Prep School students can be extended. As an organization committed to sustainability, UCC considered the environmental, social and economic implications of installing artificial turf. Specifically from the environmental perspective, this meant looking at issues related to global climate change (greenhouse gas emissions/GHGs), local air quality (heat island effect), and resource consumption (reduced water use for irrigation). What is an artificial turf system? After years of experimentation, different manufacturers have developed systems, known as “artificial” or “synthetic” turf, that are capable of mimicking the properties of real turf. The most common type uses “polyethylene” grass (which is lubricated with silicone) and has a base of expanded “polypropylene” (see Figure 1). The base is then “infilled” with a layer of rubber granules, which keeps the fibres upright and provides the right level of shock absorbency. Accepting the challenge of sustainability, UCC has demonstrated leadership by deciding to install a “carbon neutral” artificial turf field on campus. The College will plant the appropriate number of trees required to offset the GHGs emitted by the production, transport and installation of the artificial turf surface. UCC commissioned the Athena Institute (www.athenaSMI.ca) to estimate the GHGs that will be emitted during the expected 10-year average life cycle of the synthetic turf system as opposed to those that would be emitted by a natural grass surface. The GHG offset requirements are translated from units that are typically used to report GHG reductions (e.g., metric tons of carbon dioxide equivalent) to the number of trees to be planted to achieve a 10-year carbon neutral synthetic turf installation. The study conducted by the Athena Institute determined that greenhouse gas emissions produced by UCC will increase by a total of 73 tonnes as a result of the synthetic turf installation. In order to neutralize this effect, the College will plant 1,861 trees, balancing the field’s carbon footprint over its expected 10-year life. How did we arrive at this number? We took a life cycle approach to determine the boundaries and elements attributable to the synthetic turf and compared them with those of a natural turf system (see Figure 2). This procedure allows for the identification of all life cycle phases of the systems, such as production of the main components, use and maintenance, recycling and transportation. GHG emissions are measured in metric tonnes of carbon dioxide equivalent (CO2e). Total GHG emissions of the natural grass and synthetic turf systems are estimated respectively to be (-16.9) and (55.6) tonnes CO2e. In other words, the natural grass system will actually sequester more carbon than it will emit over 10 years while the synthetic turf will be a net emitter of carbon over its expected 10-year life. Therefore the required GHG emissions offset is estimated to be (-72.6) tonnes CO2e. As per U.S. Department of Energy (DOE) 1998, a medium growth coniferous tree, planted in an urban setting and allowed to grow for 10 years, sequesters 10.5 kgs of carbon, equivalent to 0.039 metric tonnes CO2 (http://www.usctcgateway.net/tool/). For each year, the sequestration rate (in kg per tree) is multiplied by a survival factor to yield a probability-weighted sequestration rate. These values are summed for the 10-year period, beginning from the time of planting, to derive the estimated 10.5 kgs of carbon per tree. Based on this per tree carbon sequestration rate, the number of trees to be planted by UCC to meet the offset requirements to achieve a 10-year carbon neutral synthetic turf installation was estimated to be 1,861 trees. >In June 2006, Upper Canada College (UCC) in Toronto took the initiative to offset the greenhouse gas (GHG) emissions related to the life cycle of the artificial turf field installed on its campus. The Athena Institute provided UCC with an estimate of the GHGs emitted during the life cycle of the synthetic turf system as opposed to those that would be emitted by a natural grass surface. A life cycle approach (from raw material acquisition through manufacturing, transportation, use and maintenance, and end-of-life disposal) was followed to determine the boundaries and elements attributable to each of the synthetic and baseline natural turf systems. 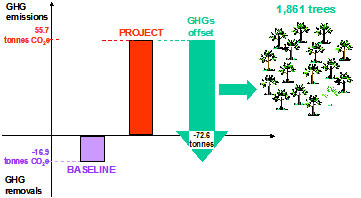 Comparison between baseline and project systems was made on the basis of the same reference unit: a 9,000-m2 field over a 10-year period. Total GHG emissions for the natural grass field and the synthetic turf were estimated to be (-16.9) and (55.6) tonnes CO2e, respectively. The total amount of GHG emissions to be offset was estimated at (-72.6) tonnes CO2e. The planting offset requirements to achieve a carbon neutral synthetic turf installation over a 10-year period (its expected life) was estimated to be 1,861 trees. This is great news on the turf as I am a big sports fan. Thanks for the very informative article. Interesting, thank you. I have a few questions, how do these fields get disposed of? Where do they go and what is the procedure? Also, did UCC consider other infill (considered “eco-friendly”) alternatives, like geosafe?